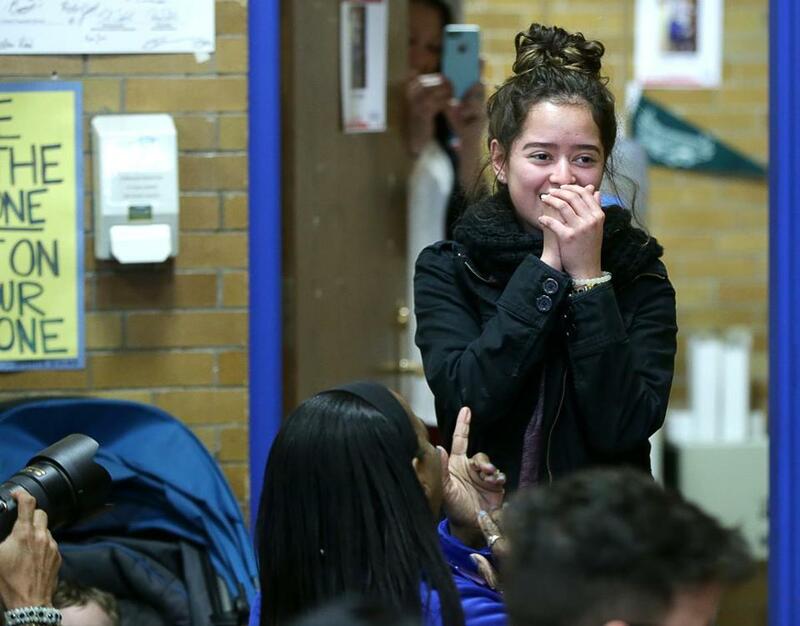 Yesica Calderon reacted to a room full of friends and family inside East Boston High School. An East Boston High School senior bound for Regis College in the fall learned Tuesday in a surprise ceremony at the school library that she had received a full tuition scholarship. Yesica Calderon’s teacher had texted her saying that she needed to see her in the “Zone”— a study space in the library designed for student athletes. Calderon walked into the room to find it packed with classmates, teachers, family, and her soccer coach, along with the media. The ceremony was organized by Boston Scholar Athletes, which partners with the public schools and runs the “Zone” to support academic achievement through athletics. Calderon became very emotional when she learned what it was all about. “I followed my teacher into the room and then ‘bam,’ and I started crying,” she said afterward. She captained the girls’ soccer team as a junior and senior. She served as a leader both on the field and in the classroom, achieving a 4.8 grade point average while taking high-level courses. Since 2014, Calderon has spent 336 hours in the “Zone” study center at school. “There were days that I would be crying because I would have to stay up really late and get homework done after a soccer game,” Calderon said. After every late night, she would wake up at 6 a.m. and do it all over again. Calderon said that even from a young age, she had always hated missing work or being late to class. Calderon decided a few months back that she wanted to go to Regis, but until she had a scholarship secured she had a Plan B. “If it wasn’t for this scholarship I probably would not have been able to afford college at all,” she said. Many of the other schools where she had been accepted had given her only a pittance. Because she is a so-called ‘‘DREAM Act’’ child, or those brought illegally into the country by their parents or guardians but now protected from deportation, Calderon said she is not eligible for any federal student aid. If she had not received the scholarship, Calderon had planned on enrolling in Bunker Hill’s EMS program instead of Regis, a private Catholic university in Weston. With a scholarship secured, Calderon now plans on studying to be a social worker. Ideally, she would like to work with young people. “I want to tell them my story,” she said. “Students in my situation should know that everybody has a purpose, and that everybody can make it,” Calderon said.